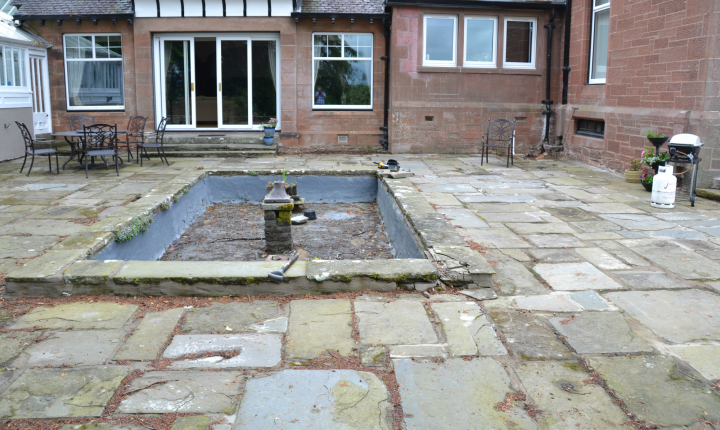 This courtyard paving project took place at a traditional property in Kirriemuir. 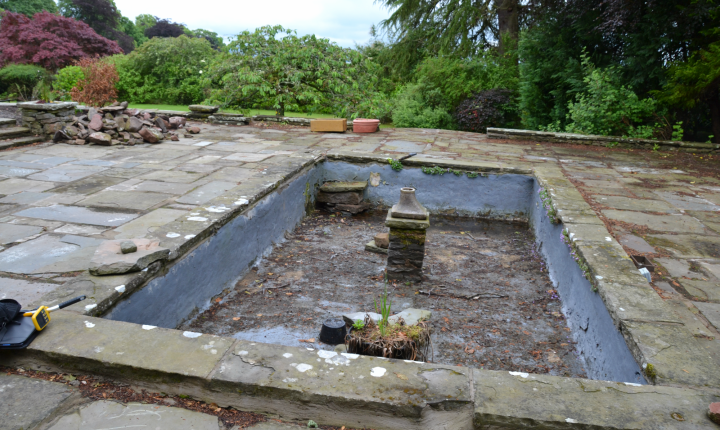 The existing courtyard consisted of a patio with a sunken pond which was looking tired and dated. The client wanted us to create a more useable space with a modern feel but also wanted the area to be lower maintenance. A design drawing was produced to present our ideas to the client. 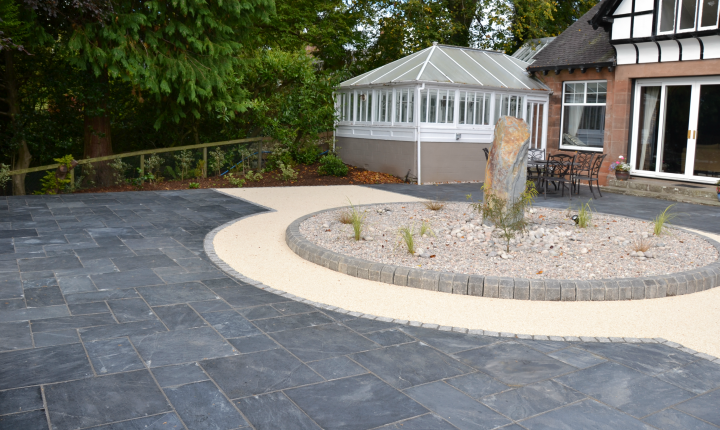 Slate paving and resin bound gravel were chosen to create a smart low maintenance area combined with a water feature. 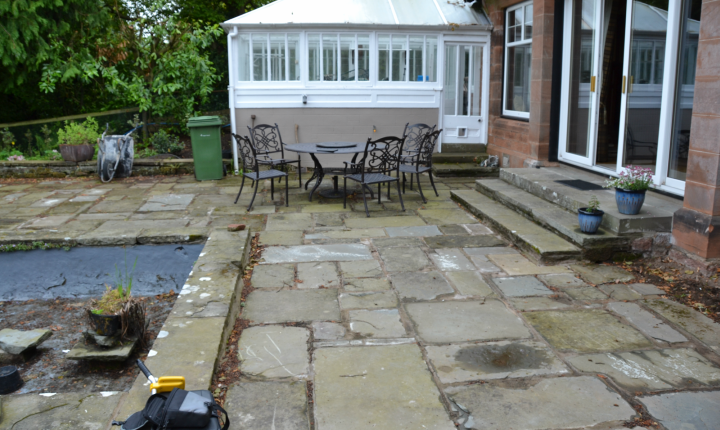 A large patio was laid using midnight blue slate in three sizes. 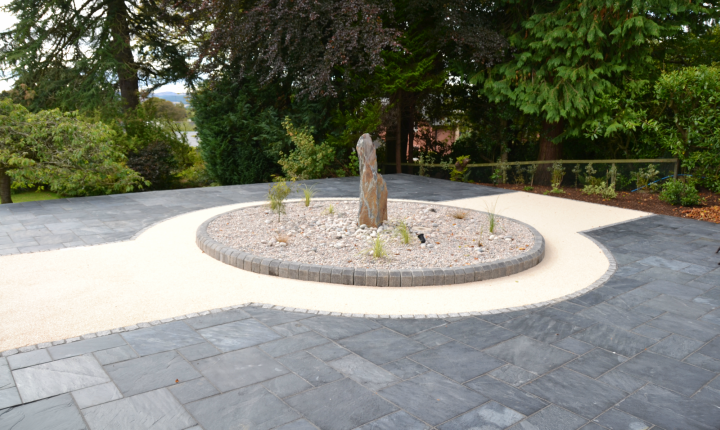 A tegula kerb edged circle was constructed in the centre of the area to house a large monolith water feature. 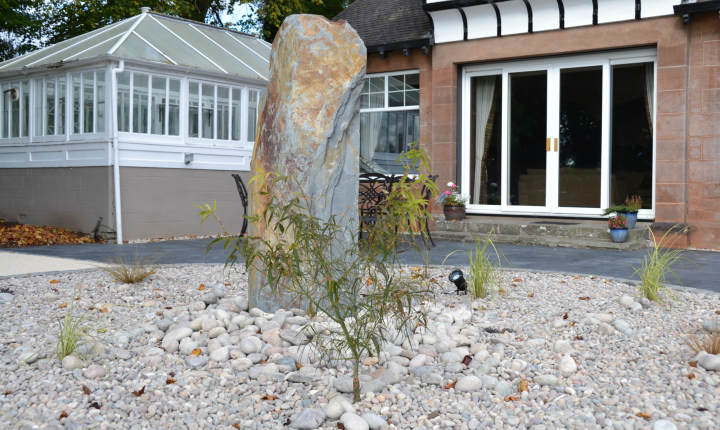 The circle surrounding the water feature was topped with beach pebbles and cobbles then planted with a selection of grasses and shrubs. 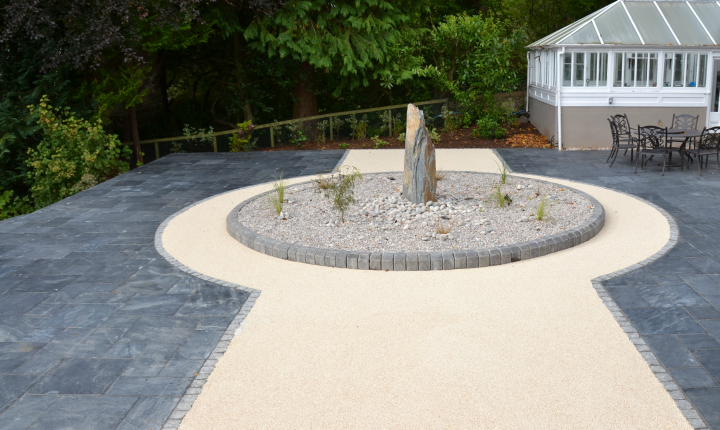 Resin bound gravel in a contrasting colour and edged with granite setts was laid to visually break up the paved area and surround the water feature. 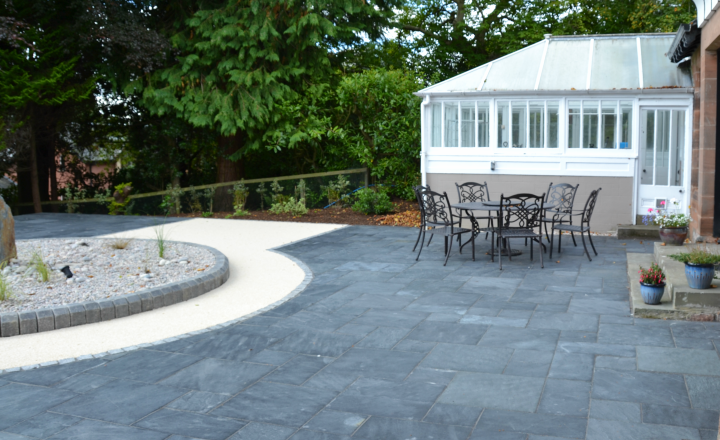 The midnight blue slate paving gives the new courtyard a contemporary feel whilst being stylish and hard wearing. 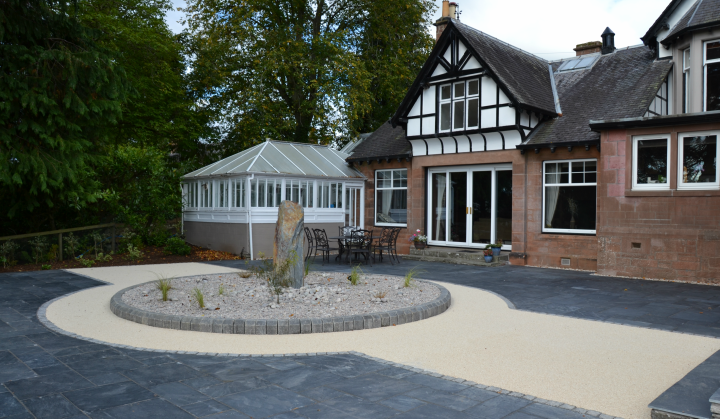 Resin bound gravel provides the perfect attractive low maintenance solution here to provide texture and contrast. The large water feature and stylish planting provides a stunning centrepiece adding height and interest to the whole area.